Preston Michaels (Norton) is a cop from Australia who is in L.A. as an “observer”. Unfortunately, he observes a murder involving corrupt cops in his precinct. This leads to the evil Conrad Drago (Thompson) and his assistant Rita (Treas), the most dastardly drug runners in town. You know Conrad Drago is evil because his name is Conrad Drago. Framed for the murder, Michaels goes on the run to clear his good name, and while doing that, must team up with Kris Fairfield (Rothrock) (not “Fairchild” as is stated in some sources). Forging an uneasy trust, the two team up to beat up a ton of baddies and get to the truth, which isn’t always easy, as both Kris and Michaels have complex backgrounds. Norton and Rothrock are two of our favorite action stars, and we always try to find the movies they’re in, both separately and together. They’re both likable and quality martial artists. Here, Norton’s Australian identity is actually part of the plot, not something no one ever mentions, as is usually the case. He plays the “fish out of water” nicely, and his personality goes well with Rothrock’s, and they have some good chemistry, which makes the film fun to watch. Most of the movie is set amongst decrepit, graffiti’d buildings, which, visually, makes a nice backdrop for movies like this, but can be a bit depressing at times. Along their journey, Kris and Michaels meet an array of colorful characters, which serves to liven up the movie. As in life, the more characters you meet, the higher the odds that a lot of them are going to be annoying, and Baby (Davies) and Hannah (Datcher) tend to grate on the nerves, while the mysterious Chan Lu (Obata) and Norton’s chief, Capt. Murdock (Bach) show us another side. As in Quietfire (1991), our heroes must fight a team of transvestites, or something close to transvestites. It must be a 90’s thing. Brian Thompson of Cobra (1986) and Perfect Target (1997) fame makes an ideal baddie. Just look at his face. It’s almost like he was born to be a bad guy. He even has an evil mullet. It’s the type of mullet that screams “I’m evil”. On the down side, the plot gets a bit too complex and twisty for its own good, continually piling on new characters. Director Winkless also directed the first Bloodfist (1989) movie, so his aims were probably to step away from some of the more traditional plotting of these action yarns. Luckily, there is some good fighting, and the two leads are likable as ever. There are some good one-liners and humor, and the movie as a whole gives you what you want. Moreso than previous Norton/Rothrock vehicles such as China O’Brien (1990). 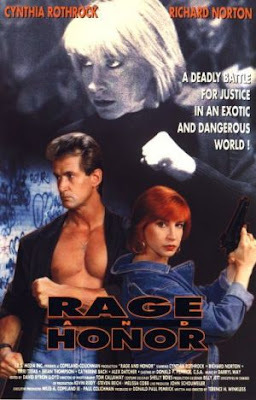 For a solid action movie featuring two leading lights of the genre Rage and Honor (not to be confused with the Sho movie Rage OF Honor, 1987) is well worth seeking out. You should! It is very enjoyable! I remember this being fun but have't seen it since it came out, so long ago now! It was pretty fun! Norton and Rothrock are the perfect action duo. I really loved this one. Solid action, great Rothrock and Norton, and a sweet baddie played by Brian Thompson with a tacked on ape drape. Good stuff. Can't agree more! This was prime Rothrock and Norton!